Now that I have your attention, please stay because the title is very true and interesting. This blog will show you just how complex our biosphere is. It is unfathomable, how big and complicated the scales are in order to run this world like it does today. We always get amazed at listening to the likes of Niel deGrasse Tyson on just how small and insignificant we are and our planet is, relative to the universe. It’s fascinating to see just how simple and basic our planet and it’s contents are compared to the processes that happen throughout the universe. It blows our mind. That’s a topic for another day. However, this example that I have given you, shows us just how much goes on, in our everyday tasks. The scales are truly massive and numbers are absolutely huge. We must always remember to pause and take a look at the amazing world that God has created for us and be grateful for our blessings. At the time of writing this blog, it’s raining pretty heavily. I also bought an entry DSLR a few months ago after begging my parents for literally years and haven’t really used it appropriately. So, naturally, I tried to capture some professional looking water drops. I used manual mode, so most of my shots were literally just black. But I did get this one image. It’s a “meh” image but I’m still proud of it. Two, where did this exact water drop come from. Let me elaborate. Water on earth had been constant since it was created. It might have changed form, reacted with different elements or even fuse and be a part many objects on our planet. But the amount of water on earth, in it’s most molecular form is always constant. Except the water that we take to the International Space Station (around 18,143.6948 kilograms per year with a crew of four). But considering the entire amount of water on earth is around 1,416,464,280,000,000,000 tonnes, I think we can forgive them. Again, back to the point; the water on earth stays on earth. No doubt. But how much is this water exactly? Yeah 1,416,464,280,000,000,000 tonnes of water is a thing, but how many water molecules is that exactly? Let’s take the example of Jesus Christ ( please forgive me, Lord ). Jesus lived for around 33 years, during -4BC to 30AD( Long Story ). Now during that lifetime, he breathed a lot of times. He probably breathed around 25,000 times a day. That’s 9,125,000 times a year. And 301,125,000 times in his entire lifetime. Even though that’s below average due to his young death (for which I am forever grateful ), that’s a lot of molecules that went into his body, reacted with his blood and exited his body carrying carbon dioxide that his body generated. Now that’s a lot of molecules by itself. But that too is small enough for us to ignore. We are going to concentrate on the water output. An average person would output atleast 1.5 liters of water every day. Let’s just assume that atleast 1 liter of that water from Jesus made it into the oceans via streams, rivers, sewage etc. or by evaporation and then it’s subsequent precipitation into to the ocean. The rates at which water molecules from Jesus made their way to streams, rivers, lakes, marshes, underground aquifers, and oceans around the world cannot be known. It is also impossible to determine how many of the water molecules in our bodies came from sources containing water molecules that were once part of Jesus. But, when we consider the following numbers, we can see that our bodies must contain many water molecules that were once part of Jesus. Water molecules are very small, only 0.31 nanometers or 0.000,000,031 centimeters in diameter, so there must be many in our bodies. 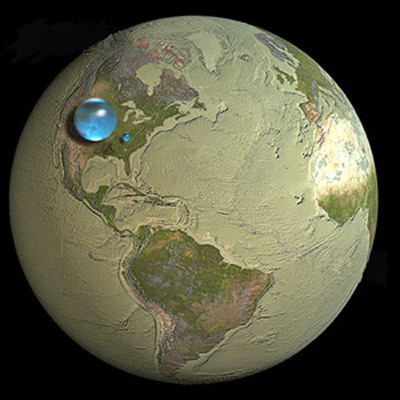 A person weighing 60 kgs contains about 1200 trillion trillion water molecules (i.e. 12 followed by 26 zeros). Remember, A human body is made of 60% water and they’re brain is made of 75% water. I did the following calculations on paper, and it doesn’t look very pretty. A lot of awkwardly large and small numbers are involved with a countless zeros in them. So, in order to avoid too many zeros, I am going to use exponentials. Now, out of context, 0.000,001 will be denoted as 1E-6 and 0.000,000,000,027 will be denoted as 27E-11. And 1,000 is written as 1E3 and 576,000,000,000 ( 576 billion ) is written as 576E9. Really hope you understood that. Can’t believe what I have become now. So now, the diameter of water is 31E-8 cm. The amount of water molecules that can fit in a straight line of 1 centimeter, is 3.2E7. So the amount of water molecules that can fit inside one cubic centimeter or a cube of each edge being one centimeter long is 3.3E22. And it takes 1000 cubic centimeters to fill a liter, so there must be about 3.3E25 water molecules in every liter of water. So the amount of water molecules that end up in the oceans from Jesus himself is around 3.3E25 water molecules per day. 365 days per year. For 33 straight years. 3.9E29 water molecules all around the world. Not to mention the sheer number of people he interacted with, healed, cured of diseases and spat on they’re eyes and in they’re mouth. This would dramatically increase the already high enough odds. You would be right if it wasn’t for one small thing. 3.9E29 water molecules is A LOT. Let me explain. The oceans contain about 1.3 billion cubic kilometers of water. That is 1.3E21 liters of water. That’s a lot too, I agree. But get this, 3.9E29÷1.3E21 is 4.6E8. That’s 460,000,000. 460 million water molecules directly from Jesus in every liter of water in the oceans. Now the concentrations of these Jesus molecules may be higher in some areas like the Mediterranean and lower in others like the Pacific. But I think about 2000 years of water flowing, winds, moving clouds, globalization and just the sheer level of physical connectivity that we have today may have tipped the scales a little and the concentrations may more or less be equal in all parts of the world today. Due to water evaporation and precipitation, these Jesus molecules have also found their way into lakes and other water supplies. So, even if the average concentration in the 1.5 liters of water molecules we consume every day is a million times less than the concentration in the oceans, we still ingest over 300 Jesus molecules every day. That would also be around 500 Hitler molecules, since he lived longer. Many of these molecules are ingested in the form of the beverages we drink and fruits, vegetables, meats, and other foods that we eat. They get into our blood, muscles, brains, and most parts of our bodies. This happens for generations and eventually we are made of molecules that were once created by some person, thousands of years ago. I hope this showed you just how complex our biosphere is. It is unfathomable, how big and complicated the scales are in order to run this world like it does today. We always get amazed at listening to the likes of Niel deGrasse Tyson on just how small and insignificant we are and our planet is, relative to the universe. It’s fascinating to see just how simple and basic our planet and it’s contents are compared to the processes that happen throughout the universe. It blows our mind. That’s a topic for another day. However, this example that I have given you, shows us just how much goes on, in our everyday tasks. The scales are truly massive and numbers are absolutely huge. We must always remember to pause and take a look at the amazing world that God has created for us and be grateful for our blessings.